As wonderful as garlic is, few of us like it in chunks. Mince it small, and it's perfect when added at the end of a saute. If you want it raw, or if you're using it for a smooth-textured item, cream it. Creaming turns your minced garlic into a velvety paste that disappears into soups and melts into vinaigrettes. 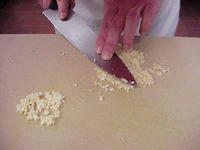 The article goes into detail as far as techniques for both mincing and creaming garlic.